The Hairy Bikers show you how to make a classic roast chicken with a tangy gooseberry sauce. For the chicken and stuffing, preheat the oven to 180C/350F/Gas 4. Cook the onions in a pan of boiling water for four minutes, then add the sage leaves and continue to boil for a further minute. Drain well and place into the bowl of a food processor. Add the breadcrumbs, butter, egg yolk, nutmeg, salt and freshly ground black pepper. Blend until the mixture is just combined and resembles large breadcrumbs (do not blend to a paste). Stuff the chickens with equal quantities of the stuffing mixture. Rub the extra butter over the outside of the chickens, then season, to taste, with salt and freshly ground black pepper. Place the chickens into a roasting tin, breast-sides up, and add just enough water to cover the bottom of the roasting tin. Cover the roasting tin with aluminium foil. 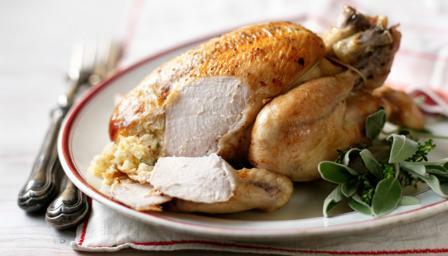 Cook the chickens in the oven for 1½-2 hours (cook the chickens for 1 hour per kg, allowing the weight of the stuffing to factor in as well). Remove the foil 20 minutes before the end of the cooking time and strain off the juices, reserving it for the gooseberry sauce. Return the chicken to the oven uncovered for the final 20 minutes, until the chicken is cooked through and the skin is golden-brown and crisp. (To check if the chicken is cooked, the juices should run clear when the chicken is pierced between the leg and the body). For the gooseberry sauce, place the sugar and water into a non-reactive pan and heat until the sugar has dissolved. Stir in the lemon zest and bring to the boil, cooking for 2-3 minutes until reduced slightly. Add the gooseberries to the pan, reduce the heat and and gently poach for 4-5 minutes, or until the gooseberries are tender. Remove from the heat and allow the gooseberries to cool in the syrup. When cool, strain the gooseberries through a sieve and reserve the syrup. Push the gooseberries through a sieve into a separate bowl. Discard the skins and solids left behind in the sieve. In a clean pan, bring the white wine to the boil with a little salt and freshly ground black pepper. Cook for 4-5 minutes, or until the liquid has reduced by half in volume. Add the chicken juices (or stock) and continue boiling until the liquid has again reduced by half in volume. Remove the pan from the heat and whisk in the butter until the sauce is smooth and glossy. Stir in the gooseberry purée and season, to taste, with a little of the reserved syrup, the salt and freshly ground black pepper.